Permanent Adhesive Backed Vinyl Sheets!! Sweet Deal!! SAVE MONEY! BEST PRICED PACKAGE! 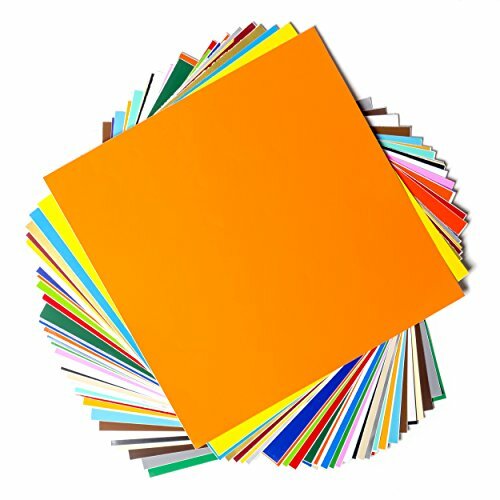 12" X 12" INCH VINYL 40 sheets in 30 different glossy colors, 2 matte colors, and 3 metallic colors. No other package on Amazon offers such a variety for such a low price. 3 mil vinyl thickness, perfect for all your crafting needs. Check the product description for a detailed description of the colors included. NOTE: Actual color of vinyl may vary slightly due to differences in monitor display. HIGH QUALITY ADHESIVE BACKING AND LINER to protect the adhesive until it is exposed and ready for use. No more cheap backing ruining and separating from the vinyl in the cutting process before usage. No need to endure a frustrating weeding process after cutting with this easy to peel liner. LIFETIME SATISFACTION GUARANTEE OR YOUR MONEY BACK. If unhappy with this product then you can send it back. However, if you find this to be the best Vinyl you've purchased on Amazon that transform your crafting experience then purchase one as a gift for a friend and share us on facebook. You won't find better all around adhesive backed vinyl sheets at this price. THIN BUT STRONG, DURABLE vinyl sheets. We've covered all corners with this product. We were tired of buying low quality products over and over again from Amazon so we decided to fabricate our own. You will not find better quality Vinyl on Amazon that has both the stregth and thinness combination. COMES FLAT AND READY TO USE WITH ALL CUTTERS. Unlike Vinyl rolls, this product comes flat and ready to use, no more stressing over bent corners. If you use cutting machines like the Cricut, Silhouette, Graphtec, Pazzles, Inspirations, Quickutz, Xyron, Craft ROBO, or any other crafting cutters that take Oracal 651 or other similar vinyl sheets then this definitely is the product for you. Order now to receive the best adhesive backed vinyl on Amazon.